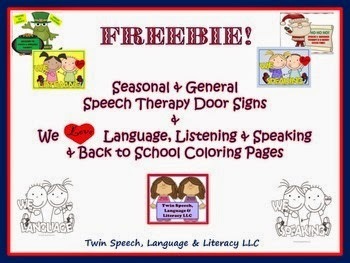 Speechie Freebies: General & Holiday Themed Speech Therapy Door Signs & Coloring Pages FREEBIE! General & Holiday Themed Speech Therapy Door Signs & Coloring Pages FREEBIE! It's August 19th, and that's our birthday friends! We have also included a brand new back to school poster and two back to school coloring pages that could be used right now! They would be fun to take out during the first week of school as an easy thing for your students to do while you discuss the up-incoming school year with them. Perhaps you could talk speech therapy goals while they color? We hope that you enjoy this birthday gift from us to you and that you all have a great school year! Go to this link to our Teachers pay Teachers store to download this 24 page freebie today!! Please follow our blog and facebook page. It would be fantastic if you did!